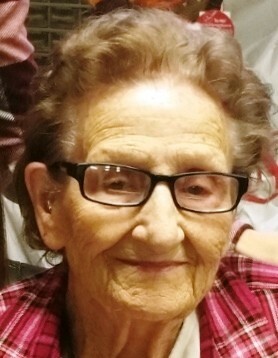 Obituary for Goldie A. Maloney | Hile-Best Funeral Home, Inc.
Goldie A. Maloney, 95, of Seneca, died peacefully Sunday morning, September 30, 2018 at Oil City Healthcare and Rehab, following a brief illness. She was born in Seneca on March 15, 1923 to the late George and Ada (Winger) Strain. Mrs. Maloney was of the Protestant faith. Goldie enjoyed sewing and quilting, hunting, carpentry and building, and working outdoors and doing yard work. In her earlier years, she worked as a private housekeeper, and was a school bus driver for Cranberry School District. She then enjoyed being a dedicated homemaker and taking care of her family. Goldie was married to Kenneth J. Maloney, and he preceded her in death on January 4, 1970. She was also preceded in death by her longtime companion of forty years, George H. Dunkle, who died January 27, 2013. She is survived by a son, Joseph R. Maloney and his wife Sandra of Seneca; two daughters-in-law, Nancy Maloney and Dottie Maloney, both of Seneca; four granddaughters, Sherry Barcinas and her husband Glenn of Seneca, Nancy Cubbit and her husband Dave, Racheal Polley, and Jennifer Maloney, all of Oil City; seven great-grandchildren: Sarah and Natalie Barcinas, Alexander Golden, Jacob Hayden, Damion Cubbit, Jordan Polley, and Jasmine Maloney; and numerous nieces and nephews. In addition to her parents, her husband, Kenneth, and her companion, George; she was preceded in death by two sons, Larry and David Maloney; and her siblings: Paul, Louis, George, and Milty Strain, Lottie Vandermark, Mary Lupole, and Winnie Whitmire. Friends and family will be received Wednesday (Oct. 3) from 6 - 7 p.m. in Hile-Best Funeral Home, 2781 Rte. 257 in Seneca, Cranberry Township. A funeral service will follow Wednesday at 7 p.m. in the funeral home with Rev. Janor Bestwick, pastor of the Seneca Evangelical Congregational Church, officiating. In lieu of flowers, memorial donations may be made to the Seneca E.C. Church, 2844 Rte. 257, Seneca, PA 16346.